The Battle of Kursk took place in July 1943 and was one of the largest and most important battles fought on the Eastern Front during World War II. Kursk was the largest tank battle in history and it was the last attempt by the German army to slow down the Soviet Military. Kursk was the last throw of the dice for Germany on the Eastern Front. The failure of the German offensive at Kursk dealt a severe blow to the army. After the battle, Germany adopted a defensive posture on the Eastern Front. 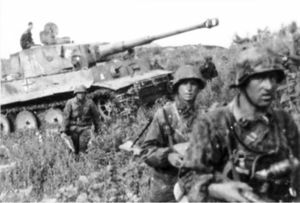 Why did Germany fail to achieve their objectives at the Battle of Kursk? Germany had invaded the Soviet Union in June 1941. At first they had driven the Red Army back to the gates of Moscow. However, winter and a Soviet counterattack prevented them from capturing Moscow. The following year the Germans launched an offensive in the south of Russia aimed at the oil fields in the Caucuses. Hitler diverted forces to take Stalingrad. The Battle of Stalingrad reversed the tide of the war for Germany and resulted in a catastrophic mistake. The entire German 6th army was annihilated at Stalingrad during the winter of 1943-1943. A successful German offensive would have greatly improved Germany’s strategic position on the Easter Front. The Germans believed that the Soviet leadership had become increasingly disenchanted with their western Allies. Despite constant demands, the British and the Americans had failed to open a ‘second front’ in western Europe. If the German forces inflicted a devastating defeat on Stalin’s armies, then the Soviets would be more likely to enter into peace negotiations with the Germans and end their alliance with Britain and the United States. This could have allowed the Germans to keep many of their gains in the east and to concentrate on their war with the western allies. Despite the recent setbacks on the Eastern Front and in North Africa, Germany remained confident that they could turn the tide of war back in their favor. The Germans believed that their army was better armed in 1943 than at any other time of the war. Hitler had appointed Albert Speer as head of the armaments industry and he had dramatically increased production. Germany, despite constant air attacks and limited natural resources, increased their number of munitions and weapons, greatly.. In 1943 the German armaments sector produced almost 12,000 tanks and had increased by 100% the number of planes made by manufacturers. Not only did the German industrial sector produce more of everything, but also they produced more advanced weaponry. The Germans had developed new tanks such as the Tiger, King Tiger, and the Panther tanks. The Luftwaffe (German air force), had the new Fokker-Wolfe 190A fighter and the Herschel 129. Since the loss of North Africa, the Germans could concentrate the majority of their army on the Eastern Front. The failure of the allies to open up a second front, allowed Hitler to station two-thirds of the German Army in Russia, by the Spring of 1943. However, the new weapons and extra manpower caused the German High Command to engage in over-optimistic planning. Based on their new weaponry they assumed that they could inflict a serious defeat on Stalin and led them to underestimate their enemy. Hitler decreed that “there must be no failure” during Operation Citadel. After from intelligence failures of Stalingrad, the German High Command collected all the intelligence that they could get. Reconnaissance planes photographed all the defensive systems that the Soviets had established in the Kursk and Oriel bulge. Despite the vast efforts spent on this intelligence gathering information the Germans failed to establish the size of the Russian forces in the area. Even though the Germans had acquired a great deal of information, they interpreted it incorrectly. This misled the Germans into overestimating their chances of success in the coming offensive. However, Russia’s military leaders had suspected that there would be an attack on the bulge between Kursk and Oriel. They believed that the Germans desperately needed to remove the bulge at Kursk. Soviet intelligence was excellent- they had first-hand accounts of German armor sent to the Oriel-Kharkov region. 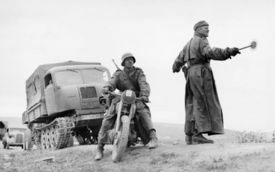 The Soviets had even captured some German officers who during interrogation divulged that the offensive would be in the Kursk area. They even gave the date of the coming German attack. The better Soviet intelligence meant that they had a decided advantage even before the battle had started. Hitler was not his overbearing self during the planning stages of the Battle of Kursk. He left the planning to his generals and they develop a highly detailed plan. Operation Citadel called for a tactic known as the double envelopment. This would allow the Germans to surround the Soviet defenders in the bulge in the Eastern Europe and cut them off from the rest of the Soviet Union. General Walter Model's 9th would attack the north of the bulge, driving south to the east of Kursk and it would seize the railway. securing the rail line from Soviet attack . A Panzer Army, led by General Hoth, would attack the southern part of the salient. This force was expected to drive north and meet Model at Kursk and achieve the objective of cutting off the Soviet units. The Soviets well-aware that an attack was coming decided to adopt a defensive strategy. The Stavka, the Soviet High Command, placed a huge number of men and equipment in the Oriel-Kursk region. 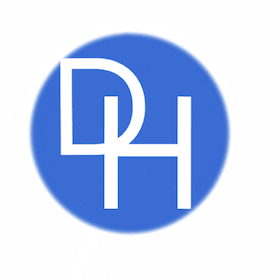 Russian and Ukrainian civilians were conscripted to build defenses in the area. They laid hundreds of thousands of mines and dug miles of trenches and anti-tank traps. The Red Army also had a huge force of reserves under the command of Marshall Zhukov. They were to either reinforce any area where the Germans threatened to break through and also to launch a counterattack. The Germans had failed to take in the defensive preparations of the Soviets and they placed too much faith on their new weapons. On the eve of the Battle of Kursk, the Germans had almost ¾ quarters of a million men, 3000 tanks, and some 10,000 artillery pieces. The Red Army had almost 2 million men, 5000 tanks, and 20,000 heavy guns. The Germans had anticipated that they would be outnumbered but they believed that their superiority in training and equipment would allow them to succeed. On the night of July 5th, to pre-empt the attack, the Russians launched a massive artillery bombardment. This initially threw the Germans into disarray and it delayed the attack for three hours. The Germans attacked in the early morning, they attacked the north of the salient with 500 tanks. After 24 hours, they had lost thousands of men and many tanks. Germany started her attack at dawn with an artillery barrage. A tank and infantry attack started at 05.30 once air cover had arrived. The main thrust contained 500 tanks; heavy tanks at the front, supported by medium ones behind with infantry behind these. They only gained a few miles. The German attack was ferocious but it had not been successful. Repeated German attacks were resisted by the stubborn Red Army defenders. One German armored division had lost two-thirds of its tanks. The Soviets quickly adapted to the threats posed by the new tanks, even the fearsome Tiger tanks. They Soviet gunners learned to aim at the lightly armored sides of the tank. The German faith in their wonder weapons was misplaced and this led them to make poor decisions and to suffer unnecessary casualties. The German Generals continued with the offensive. Some 50th kilometers south of Kursk, the greatest tank battle in WW II took place. The Germans tried to capture Kursk with 1,5000 tanks on July 12th. Despite infecting heavy losses on the Red Army tank formations, they did not advance to Kursk. Within two weeks the Germans had been pushed back to where they had started on the southern side of the Kursk salient. However, the divisions under Model had made real progress. The Soviet overall-chief Marshall Zhukov ordered a counter attack and this pushed Model’s units back some 45 miles. General Model was forced to retreat to the Hagen Line, an existing line of defense. He persuaded Hitler to allow the German forces to end the offensive and to retreat before they became encircled by the Red army and to avoid another Stalingrad. The Germans during their retreat came under constant attack from partisans. They destroyed many miles of railway lines and caused massive disruption in the German rear. The Soviets took advantage of the German retreat to capture the city of Kharkov. The liberation of this city is usually seen as the end of the Battle of Kursk. One aspect of the Battle that is often overlooked by historians was the aerial battle between the Luftwaffe and the Soviet air force. By 1943 the position of the Luftwaffe had started to weaken and it was beginning to lose its traditionalair superiority over the Soviet Air Force. This shift was Due to the dramatic diversions resources to the western front west. The Luftwaffe was firced to defend German cities from the intense Allied bombing campaign. The Luftwaffe could only achieve air superiority in local areas. By 1943, less than 40% of the Luftwaffe was stationed on the Easter Front. During the Battle of Kursk, it was expected by the German High Command that the Luftwaffe would play a key role in the battle. They were persuaded of this by the Luftwaffe’s new planes, that they believed to be much superior to the Russian planes. . However, the Luftwaffe was unable to achieve air superiority and as the battle progressed it lost the initiative to the Soviet Air force. This meant that the Germans could not use the Luftwaffe to secure its objectives at Kursk. Indeed, in the closing days of the battle, for the first time in the war on the Easter Front, the Russian air force came to control the skies and inflict terrible damage on the retreating Germans tanks and vehicles. The German military’s failure to secure air superiority over Kursk was one of the main reasons why the battle resulted in a German defeat. This was another example of the unrealistic expectations of the Germany army before the Battle of Kursk. Both sides at the Battle for Kursk suffered terrible casualties. The Germans are estimated to have lost some 200,000 men killed or missing in action. They lost some 2000 tanks and thousands of pieces of artillery. They also lost some 700 planes. The Soviet lost some 250,000 men, killed or missing in action. Some 6000 tanks , 3000 guns and one thousand planes are lost during the battle. The Soviet’s had the capacity to replace the men and equipment, but the Germans could not replace the losses. This weakened their position on the Eastern Front. The Battle of Kursk was a turning point in the war on the Eastern Front. The Germans had failed to reach their objectives and they had suffered huge losses. The German air force after the battle, began to lose the control of the skies. After Kursk the Germans in the East were on the defensive. 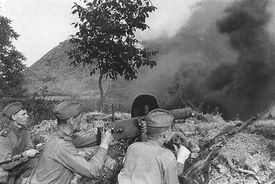 They had lost the battle for several reasons, overoptimistic planning, a failure to appreciate that the Soviet air force had improved and they underestimated the Soviet defenses around Kursk. Significantly, they also believed that their new weapons would earn them a victory and this over reliance on new and untested military technologies, such as the Tiger Tanks, played a critical role in their defeat in the most famous tank battle in history. ↑ Barbier, Mary Kathryn, Kursk: The Greatest Tank Battle, 1943 (Zenith Imprint 2002), p. 113.